Dressing for work can be challenging! However, in the Marketing and Communications departments at UPMC there are three basic dress codes that apply to different work situations. For a majority of workdays, the style is most accurately described as “trendy business casual,” but to mark the start of the weekend, the departments celebrate with casual Fridays. Finally, there are a few occasions that require business professional attire. The term “business casual” means something different at every workplace. Use the tips below to gain insight into what it means for Marketing and Communications at UPMC. All are acceptable and allow for a wide variety of clothing options. Express your personality and creativity with clothing in your favorite color or pattern. Accessorize with your favorite jewelry. Finish off your outfit with a statement necklace or fun earrings. Avoid short hemlines and plunging necklines. Keep dresses and skirts to just above the knee, refrain from wearing shorts, and be mindful of necklines that are overly revealing. Be mindful of heel height. Open and closed toed shoes and sandals are fine, but avoid overly high heels and flip flops. Avoid jeans, but dress pants of any color are appropriate for the work week. Button-up shirts and ties are expected Monday through Thursday, and they can be of any width, pattern or color that appeals to you. Brown, black or grey dress shoes are appropriate, but avoid casual sneakers, sandals and flip flops. As a general tip, casual does not mean sloppy. It is important to maintain a sense of professionalism despite the laid back dress code. Also, remember to account for any important meetings that require the normal dress code. On Fridays, jeans are encouraged as long as they are not distressed. Opt for less-formal dresses and tops. Do not feel obligated to wear jeans on casual Fridays. Sundresses are a great option, particularly for the summer. Abide by the same hemline, neckline and footwear suggestions above. Anything that is overly short or low-cut should still be avoided, even on casual Fridays. Jeans are welcome, but avoid shorts. Feel free to wear jeans on Fridays, as long as they are not cut-offs. You can still wear pants of any color, but refrain from wearing shorts unless you are told that you are attending an event where shorts are acceptable. Ties are not expected on casual Fridays, so you can save yourself a few minutes in the morning! On Fridays, it is acceptable to opt for less formal footwear, but still avoid sneakers and sandals. Despite the laid back dress code, still tuck in your shirt to maintain a sense of professionalism. For presentations, as well as any other meetings with executives, Summer Associates are required to wear business professional attire, meaning a full suit. 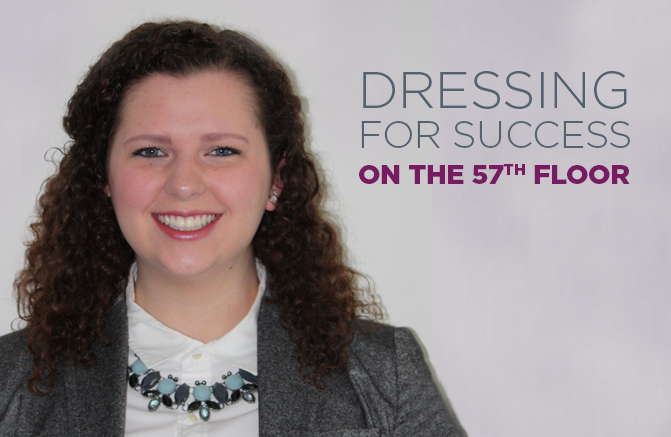 Follow the tips below to ace your presentation attire. Wear pants or a skirt, it’s up to you! Pant suits or skirt suits in neutral colors are appropriate. Pick whichever makes you feel confident. If you choose a skirt, make sure it is not too short. Business professional does not have to mean stuffy and boring. Add a pop of color with your blouse or jewelry. Summer Associates are required to present without a podium, so wear shoes that are comfortable for standing. Any neutral color, from traditional black or navy to a more modern grey or lighter blue, is appropriate for your presentation. While it may seem like a no-brainer, remember to wear a tie and a nice dress shirt. Marketing and communications professionals are creative people, and their clothing is no exception. Hopefully these guidelines will help to answer the imminent “What should I wear?” questions in the Marketing and Communications departments at UPMC!